A Notes From a Basement post dedicated to the Christmas season was out of the question in 2015 because in previous such posts I’ve presented all or most of the suitable music in the vaults to which I have publishing rights. More important, I had no big ideas to explore this year, which shouldn’t be an excuse, but there you go. 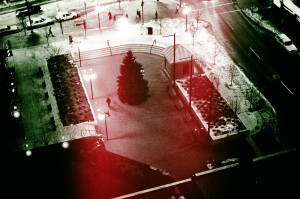 A digitally manipulated view of Congress Square Plaza in Portland, Maine, from the Top of the East in December 1984. Hubley Archives. Instead, I took a holiday song already issued from the Basement — a 1995 recording of “Looking for That Christmas Feeling,” performed by the Boarders in rehearsal for a Christmastime gig at the Free Street Taverna — and used it as the basis for a video comprising still and moving images. 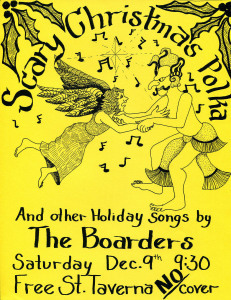 The Boarders’ multi-talented bassist, Gretchen Schaefer, created the poster for this 1995 gig. Hubley Archives. With the exception of a shot of the side yard in South Portland that Harriette Hubley took around 1981 and some 1988 Fashion Jungle footage from a concert produced by South Portland Television, the images were taken by me or by Gretchen Schaefer. They represent locations as diverse as from Boston and Cambridge, Mass. ; Charleston, S.C.; San Francisco and Denver; Brattleboro, Vt.; and Portland, South Portland and Cornish, Maine. 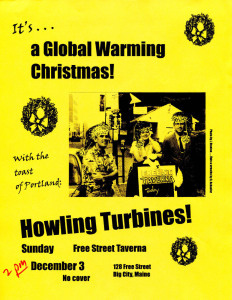 This Howling Turbines poster for a December 2000 date was a group effort. Gretchen Schaefer created the Santa hats to superimpose on Jeff Stanton’s image of the Howling Turbines, taken at the Free Street Taverna on a 90-degree day. I wrote and laid out the poster. Hubley Archives. 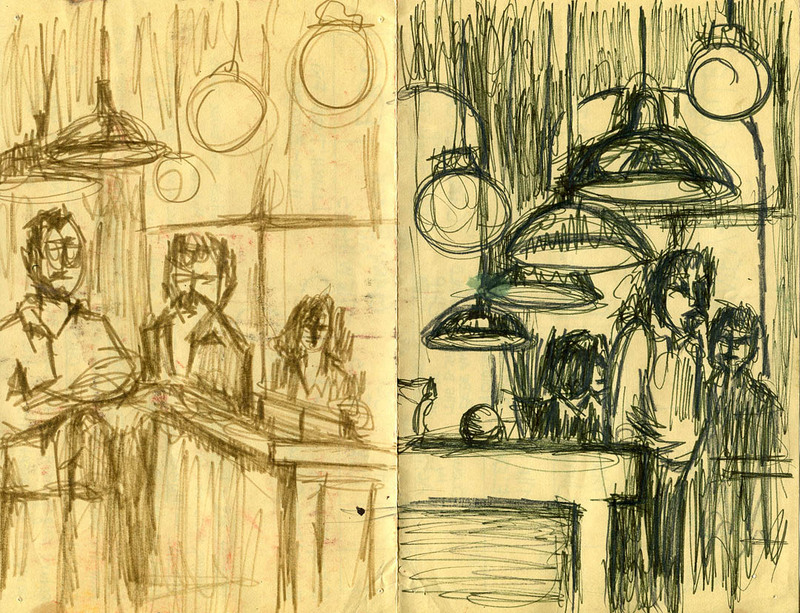 Of particular note is a 1981 drawing of the Portland nightclub Kayo’s that Gretchen made, and scenes from the Christmas greeting film, loosely (and I mean loosely) based on Dickens’ “A Christmas Carol,” that we shot on magnetic-sound Super 8 film in 1986. The facially immobilized blonde is a Buffy the Vampire Slayer doll that Jeff Stanton gave Gretchen for her birthday in the early 2000s, and that we now use for a Christmas tree ornament. The video was edited in iMovie on Dec. 21–22, 2015.